Rhizomes short, stout, praemorse. Scapes 1-2 per rhizome terminus, round in cross section, 3-6.5 dm, ± slender to stout, glabrous. Bracts sessile to subsessile; blade rhombic, 10-20 × 6-20 cm, often wider than long, not glossy, base attenuate, apex acuminate. Flower carried beneath bracts, odor faintly sweet; sepals spreading, pale green, lanceolate-acuminate, 25-50 × 6-18 mm, margins involute, apex acuminate; petals spreading to recurved distally, adaxially crimson, maroon-red, or brownish red, abaxially paler, grayish pink or rose, veins engraved, ovate-suborbicular, 3-6.5 × 4-6 cm, somewhat fleshy, base rounded and overlapping, margins entire, apex acute; stamens conspicuous, ± erect to weakly recurved, 15-25 mm, longer than pistil at anthesis; filaments grayish purple to blackish purple, longer than anthers, 5-12 mm, slender; anthers weakly recurving, grayish purple to maroon, slender, dehiscence introrse; connectives purple, barely equaling anther sacs; ovary small, maroon or dark reddish purple, ± globose to conical-pyramidal, 6-ridged, 3-12 mm, basal attachment less than ovary width; stigmas erect, recurved, distinct, gray-purple, not lobed adaxially, basally widened, ± linear distally, 2.5-6.5 mm, fleshy; pedicel horizontal to declined-drooping, ± straight, 2-13 cm. Fruits dark reddish maroon, ovoid, obtusely angled, relatively small, 1-1.4 × 1-2 cm, pulpy. 2n = 10. Flowering mid--late spring (late Apr--early Jun). Rich woods, often on steep slopes, ravines, stream banks, and deep, wind-sheltered, moist coves; 300--700 m; Ala., Ga., N.C., S.C., Tenn. Although sometimes submerged within Trillium erectum, T. vaseyi has a later blooming season, a nodding flower of much larger size, a sweet fragrance, and cove habitat unlike that of T. erectum. In my garden hybridization experiments, T. vaseyi hybrids have different color patterns than T. erectum hybrids. 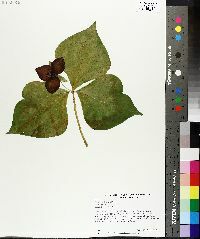 Trillium vaseyi is clearly a distinct species. It frequently hybridizes with T. rugelii.